Anasztazia Szilagyi, husband Dezso Nemeth, and their two children Mark (21) and Mercedesz (10) will be deported this evening back to Hungary where they face neo-Nazi violence. Their request for a stay of deportation was refused by the Federal Court’s Justice Locke this morning, less than twelve hours before the family is scheduled to be deported. Yesterday marked the 70th anniversary of the liberation of Auschwitz, where approximately 23,000 Roma were systematically massacred, out of a total of 500,000 Roma murdered from 1939 to 1945 in Europe. The same racist violence that lead to these events, using the same symbols and language, is on the rise again today in Hungary. 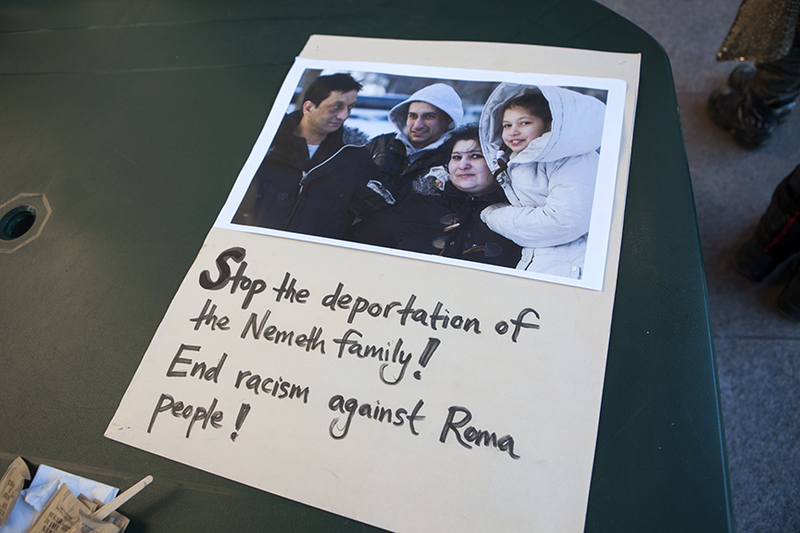 The Nemeth family came to Canada in 2011, fleeing this anti-Roma violence that they had personally experienced. In court yesterday, citing a Harvard study published last year, the Nemeth family’s lawyer Me Éric Taillefer described the situation in Hungary as “pre-genocidal”. He asked Justice Locke to stop the deportation until the family had a pre-removal risk assessment. Because Hungary is on the federal government’s newly-created “safe country list”, the family is denied a pre-removal risk assessment until 2016. As Me Taillefer pointed out, this means that new evidence about the risk in Hungary, not available at the time of the family’s hearing, was never considered. The Nemeth’s refugee claim was heard by commissioner Anna Brychcy in 2013. Brychcy had one of the lowest acceptance rates in the refugee board. In 2013, she refused all claimants from Hungary. She rejected the Nemeth family, finding that Hungary protects its Roma citizens. However, the following year, Anasztazia and Dezso’s two older children were heard by a different commissioner. They were granted refugee status because the commissioner found that Hungary does not protect its Roma citizens. The family will be separated, with one part allowed to stay in Canada and the other deported to face anti-Roma racism and neo-Nazi violence.